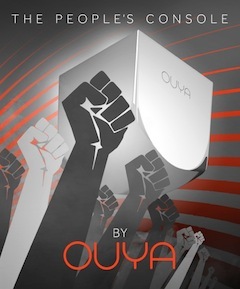 Julie Uhrman, the founder and CEO of OUYA, visited the Chicagoland tonight at a function organized by the Chicago chapter of the International Game Developers Association. Her goal was to introduce to the new open source video game console to local game developers, as well as answer their questions and gather their ideas ahead of the consoles release — first to their Kickstarter funders at the end of March, and then more widely this summer. I attended the presentation, and reported on it for Clearance Bin Review. penny? I’m not very webb savvy so I’m not 100% positive. Any recommendations or advioce would be greatly appreciated. All I use is WordPress.com (so the free version) and I pay a little bit each year to have a more branded URL. I find WordPress very easy to use and modify to fit whatever the goal you have for the blog/site. I’ve gone through numerous templates for the blog’s layout, and I like this one because it is visually-oriented and free (always important).